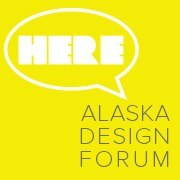 The Alaska Design Forum (ADF) is a non profit organization of architects, artists, and designers formed to broaden the range of discussion of the design of the built environment. As an educational group, ADF presents programs which expose the community to leading edge design and art ideas and encourage discussion on the relevance of these ideas to life and design in Alaska.The ADF has active chapters in Anchorage, Fairbanks, and Juneau, and has also presented programs in other Alaskan locations. The goal of the ADF is to motivate people to discuss, think and ultimately act to create a built environment that inspires the soul and protects the body. Alaska is in a unique geographic, climatic and social setting. As individuals and as a community we constantly strive to develop a unique and appropriate design response. As an organization, ADF encourages the discussion of design in various forums. The core of the program is the annual lecture series. Each year, between six and eight lectures are presented – by nationally and internationally recognized architects, designers and artists – in Fairbanks, Anchorage and Juneau.